For this post, we wanted to try and dip into some actual facts for Christmas. Here are our list of Top Facts and Top Myths for Christmas here in the UK. We celebrate Christmas Day on the 25th of December. This is supposed to mark the birth of Jesus Christ but interestingly, there is no mention of December 25 in the bible and most historians believe he was born in the spring. Throughout Europe, Christmas Gifts are often left in shoes or boots put out by the children. In Italy, the UK and the USA presents are left in stockings, often left hanging by a fireplace. In many countries, presents for friends and family may be left under the Christmas Tree. In the UK, they are often opened on Christmas day morning with all the family together. Another Christmas tradition stemming from Saturnalia was the Christmas tree. 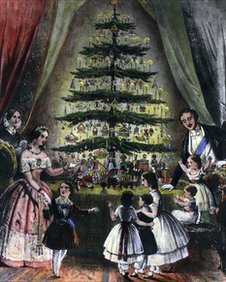 Prince Albert introduced the Christmas Tree to the UK by presenting one to Queen Victoria in 1848, as per the sketch below. After this, tradition took hold and the tree remains deeply rooted in festivities here to this day. Whether you believe or not, it doesn’t matter. Have fun and be jolly but take a moment to think about someone else. For many, Christmas is the happiest time of the year. For others, it’s the loneliest. Be kind and spare a thought or do something good to help someone else this Christmas.